OWC announced price cuts for its SandForce-based Mercury Pro solid state disks for the 2008/2009 MacBook Air, PowerBook, and iBook. They're branded towards Mac users but are also compatible with regular desktop PCs, laptops and netbooks. 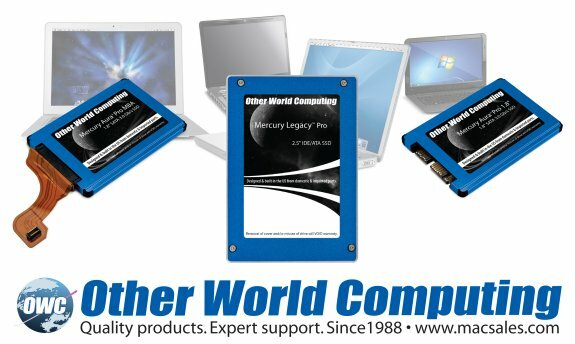 Other World Computing (OWC®) http://www.macsales.com, a leading zero emissions Mac® and PC technology company, today announced it has lowered it prices by up to $50 on three of its OWC Mercury Pro SSDs: The Mercury Aura™ Pro MBA for 2008/2009 MacBook® Air, the Mercury Legacy™ Pro for all notebooks that use a 2.5" IDE/ATA drive, and the Mercury Aura Pro 1.8" for netbooks, subnotebooks, and special applications that utilize a 1.8" SATA drive. The first and only high performance SandForce processor based SSD for 2010 Apple MacBook Air models. High performance 2.5" SATA Revision 2.0 SSD for demanding portable and desktop tower use. Ultra high performance 2.5" SATA Revision 3.0 SSD for prosumers and A/V, photography, and graphic production professionals.